This post has information on what you need to do to write software for iOS during the course. The information here may be updated during the semester. This post was most recently updated in September 2011. You must register as an Apple Developer to get access to development tools and reference resources, and to be able to install the software that you write on a device like an iPhone, iPod touch, or iPad. For this course, you can register for free. This enables you to install the software that you write on a device that you can physically connect to your computer. Alternatively, if you are interested in writing software that can be distributed through the App Store, or for internal distribution within a company/organization, then you must pay an annual fee. 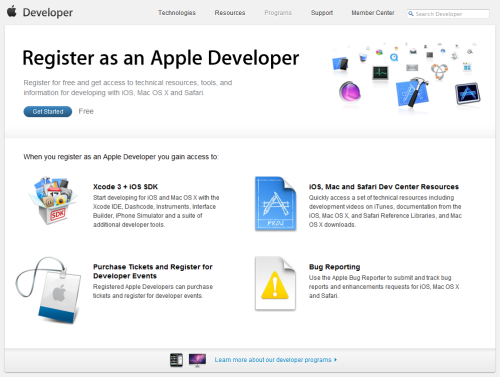 Here is the link to the home page to Register as an Apple Developer. Click the “Get Started” button. 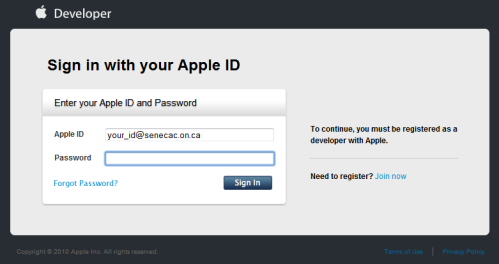 After you have registered, you can login to the iOS Dev Center. The direct link to login is here. Save it as a bookmark. However, if you are on a school or public computer, go to the following URL, and click the link for the “iOS Dev Center”, and then click the “Login” button. Do you need your own Mac to take this course? The College has hundreds of Macs, in lab rooms, and in the Learning Commons (library). We acknowledge that you like to work on your own computer, often at home, and in the evening or overnight. Doing your work for this course requires you to do it during the time that you’re on campus. How can you save your work? Use a USB memory stick. Then, make a backup of its contents regularly. Alternatively, use a remote file storage system, along with the local Mac’s file system. When you’re using Xcode, work with your project on the local file system. When you want to save it, zip it (i.e. right-click the project folder name, and choose to “compress” it; the resulting file is a normal zip file), and then move/send it to your remote file storage system. Your Mac should be running Mac OS X 10.7 or later (Lion). First, install the Xcode version that was included with your Mac. Xcode isn’t installed by default, so you will have to install it from your Mac OS X DVD. Then, download and install the most recent iOS SDK. The iOS Simulator is a useful development tool. Here are some helpful tips. Home button: Click the home button to exit/suspend your program. Don’t just kill the iOS Simulator. The keyboard shortcut to click the home button is Command+Shift+H. Manage screen icons: Click and hold an app icon for a second, and the screen editing function starts, where all the icons start wiggling. You can click-and-drag to move them around, or from one screen to another (click-and-drag the icon near a right or left edge, and wait for the screen to change). You can also delete an individual app by clicking the X badge. Reset: On the iOS Simulator app menu, there’s a choice to reset all contents and settings. That will return the simulator back to its original state. The “Equipment Loan Form” will be distributed in class during the first few weeks of the course. In a week or two, during a lab session, we will cover the procedure that enables you to configure your iPhone or iPod touch, so that you can install and run the software that you are creating. The procedure will also be documented here. It changes a bit every semester, so check back soon.